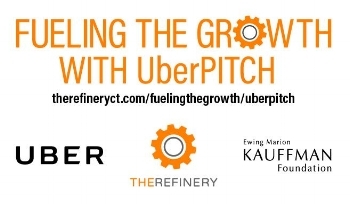 The Refinery, Uber and the Kauffman Foundation are pleased to announce the 25 semi-finalists from five U.S. cities who will be pitching to investors in the Fueling the Growth with UberPITCH competition on Wednesday, November 16, at the Stamford Innovation Center. The semi-finalists will pitch their businesses from 11 a.m. to 2 p.m. ET to a group of investors, who will then select 10 finalists to pitch again in that evening, from 7 p.m. to 9 p.m., to split $120,000 in grant awards. All 25 semi-finalists will be showcasing their companies from 6 p.m. to 7 p.m., just prior to the finals pitch. The semi-finalists were selected out of a field of more than 275 who applied to compete in the investor pitch competition. On October 26, 150 women tech entrepreneurs pitched to investors while taking a fifteeen-minute Uber ride. Thirty investors heard the pitches in five cities, including Providence, New Haven, Stamford, Washington DC and Kansas City. The investors selected the top companies from those rides to be the semi-finalists. “Our goal in hosting Fueling the Growth with UberPITCH was to get as many women entrepreneurs, as possible, in one on one meetings with investors to pitch their companies and get feedback” said, Refinery co-founder, Janis Collins. Providence, RI - Bioarray Genetics, Vitae Industries, Sproutel and BREONICS. The Refinery is an accelerator that fuels the growth of early stage ventures with diverse teams. In two years, The Refinery has achieved rapid results: 62 companies mentored by 75+ subject expert mentors, through five program cycles, who have raised $10 million+ in funds. Further information can be found on The Refinery’s website. The Ewing Marion Kauffman Foundation is a private, nonpartisan foundation that aims to foster economic independence by advancing educational achievement and entrepreneurial success. Founded by late entrepreneur and philanthropist Ewing Marion Kauffman, the Foundation is based in Kansas City, Mo., and has approximately $2 billion in assets. For more information, visit our website, and follow the Foundation on Twitter and Facebook. Uber is a technology platform that is evolving the way the world moves. By seamlessly connecting riders to drivers through our apps, we make cities more accessible, opening up more possibilities for riders and more business for drivers. From our founding in 2009 to our launches in over 400 cities today, Uber’s rapidly expanding global presence continues to bring people and their cities closer. For more information, visit uber.com.